A Bully Whippet - Above, this is Wendy. She has two copies of a double muscling phenotype. Whippets are sometimes used in racing and breeders of these racing whippets found that some successful racing dogs with increased muscling produced progeny with this muscling trait and similar racing success. 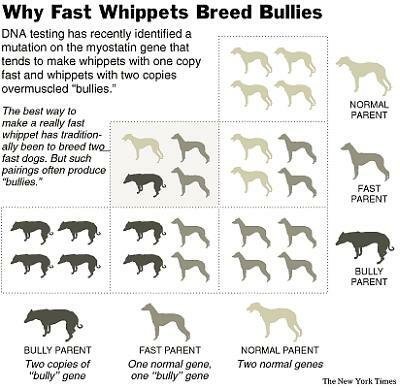 However, if two carriers of this trait were bred together, these dogs sometimes produced heavily muscled dogs that gave the whippets a "bully" appearance such as that which Wendy has in the top photo. Breeders got together and tested both affected and unaffected dogs to try and find the gene causing these distinctions. 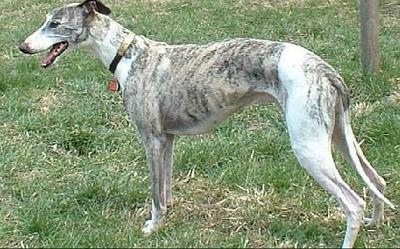 It has been found that the wild-type whippet in this case meaning the normal whippet, did not have a copy of this mutation that affects muscling. 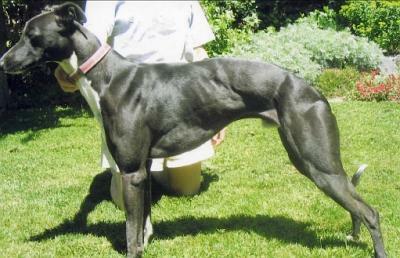 Intermediate affected dogs, successful racers with more muscling than average, had one copy of this mutated gene. Bully whippets all had a double copy of the gene. An individual's genetic profile can play a role in defining their natural skills and talents. The canine species presents an excellent system in which to find such associative genes. The purebred dog has a long history of selective breeding, which has produced specific breeds of extraordinary strength, intelligence, and speed. We have discovered a mutation in the canine myostatin gene, a negative regulator of muscle mass, which affects muscle composition, and hence racing speed, in whippets. Dogs that possess a single copy of this mutation are more muscled than normal and are among the fastest dogs in competitive racing events. 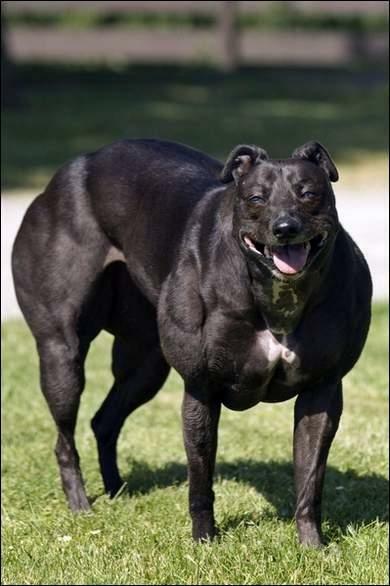 However, dogs with two copies of the same mutation are grossly overmuscled, superficially resembling double-muscled cattle known to possess similar mutations. This result is the first to quantitatively link a mutation in the myostatin gene to athletic performance. Further, it emphasizes what is sure to be a growing area of research for performance-enhancing polymorphisms in competitive athletics. Future implications include screening for myostatin mutations among elite athletes. However, as little is known about the health issues and potential risks associated with being a myostatin-mutation carrier, research in this arena should proceed with extreme caution. Double muscling is a trait previously described in several mammalian species including cattle and sheep and is caused by mutations in the myostatin (MSTN) gene (previously referred to as GDF8). Here we describe a new mutation in MSTN found in the whippet dog breed that results in a double-muscled phenotype known as the “bully” whippet. Individuals with this phenotype carry two copies of a two-base-pair deletion in the third exon of MSTN leading to a premature stop codon at amino acid 313. Individuals carrying only one copy of the mutation are, on average, more muscular than wild-type individuals (p = 7.43 × 10−6; Kruskal-Wallis Test) and are significantly faster than individuals carrying the wild-type genotype in competitive racing events (Kendall's nonparametric measure, τ = 0.3619; p ≈ 0.00028). These results highlight the utility of performance-enhancing polymorphisms, marking the first time a mutation in MSTN has been quantitatively linked to increased athletic performance. To see the paper on this study, go here. Normal whippet - "wild type"
It is interesting that half of the Bully Whippets have the upper mandible so long as it is. at first, i thought that the top pic was photoshopped. i really thought that it was a goof! i'm fascinated with genetics & took it as a minor in my biology degree. it's interesting that the gene that gives the 'bully' appearance also makes the lower jaw shorter. thank-you for posting such an interesting article! This is a very interesting topic, we'll be learning more about this in the future I hope. There are two corrections I'm sure you will be interested to note. 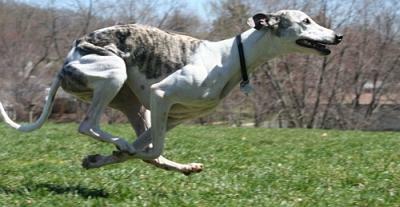 A whippet that has one copy of the myostatin gene is undistinguishable from one that hase none. Some are well muscled, some are tiny and not overly muscled. You can NOT tell by looking. That is what makes it so important for us to find a test for the gene. Another important note; breeders are NOT euthanizing any Double muscled pups because of their looks. Whippets with two copies of the Myostatin gene have mild to severe cramping...the ones with severe cramping can be very painful, and they cramp even at rest or while sleeping. Thanks jammin, I read those comments too. The dogs with one copy of the gene are still phenotypically variable. I'm really curious about the double muscling having a correlation with the overbite (or shortened lower jaw). If its cause is somewhat mechanical -- eg, does it have something to do with muscle activity (cramping? spasticity?) in cheek muscles causing shortening of the lower jaw. Or is it perhaps due to some cross loci effect (epistasis? hypostasis?) that is enabled when there are two copies of the mutation? Rican, the issue in whippets is due to a mutation in the breed, and is associated with other issues of health in the breed as well. 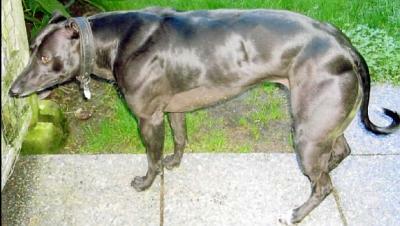 Mutations are not always straight forward -- a protein that codes for more muscle can have some regulatory effect on the skeletal structure (in whippets, it creates a form of malocclusion, abnormal jaw alignment, as described) and mutations can affect endocrinology, muscle endurance, temperament, survival of the fetus, and other things. Mutations can be very unpredictable and can sometimes have serious undesired effects.